Thermochemistry is a branch of chemical thermodynamics, the science that deals with the relationships between heat, work, and other forms of energy in the context of chemical and physical processes. As we concentrate on thermochemistry in this chapter, we need to consider some widely used concepts of thermodynamics. Substances act as reservoirs of energy, meaning that energy can be added to them or removed from them. Energy is stored in a substance when the kinetic energy of its atoms or molecules is raised. The greater kinetic energy may be in the form of increased translations (travel or straight-line motions), vibrations, or rotations of the atoms or molecules. When thermal energy is lost, the intensities of these motions decrease and the kinetic energy falls. The total of all possible kinds of energy present in a substance is called the internal energy (U), sometimes symbolized as E.
As a system undergoes a change, its internal energy can change, and energy can be transferred from the system to the surroundings, or from the surroundings to the system. Energy is transferred into a system when it absorbs heat (q) from the surroundings or when the surroundings do work (w) on the system. For example, energy is transferred into room-temperature metal wire if it is immersed in hot water (the wire absorbs heat from the water), or if you rapidly bend the wire back and forth (the wire becomes warmer because of the work done on it). Both processes increase the internal energy of the wire, which is reflected in an increase in the wire’s temperature. Conversely, energy is transferred out of a system when heat is lost from the system, or when the system does work on the surroundings. as shown in [link]. This is one version of the first law of thermodynamics, and it shows that the internal energy of a system changes through heat flow into or out of the system (positive q is heat flow in; negative q is heat flow out) or work done on or by the system. The work, w, is positive if it is done on the system and negative if it is done by the system. The internal energy, U, of a system can be changed by heat flow and work. If heat flows into the system, qin, or work is done on the system, won, its internal energy increases, ΔU > 0. If heat flows out of the system, qout, or work is done by the system, wby, its internal energy decreases, ΔU < 0. A type of work called expansion work (or pressure-volume work) occurs when a system pushes back the surroundings against a restraining pressure, or when the surroundings compress the system. An example of this occurs during the operation of an internal combustion engine. The reaction of gasoline and oxygen is exothermic. Some of this energy is given off as heat, and some does work pushing the piston in the cylinder. The substances involved in the reaction are the system, and the engine and the rest of the universe are the surroundings. The system loses energy by both heating and doing work on the surroundings, and its internal energy decreases. (The engine is able to keep the car moving because this process is repeated many times per second while the engine is running.) We will consider how to determine the amount of work involved in a chemical or physical change in the chapter on thermodynamics. As discussed, the relationship between internal energy, heat, and work can be represented as ΔU = q + w. Internal energy is a type of quantity known as a state function (or state variable), whereas heat and work are not state functions. 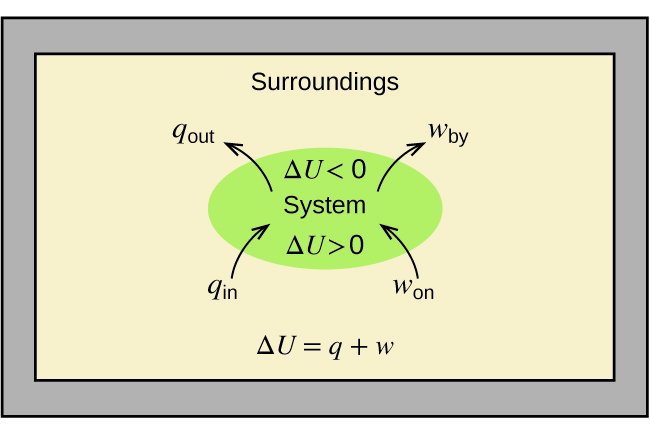 The value of a state function depends only on the state that a system is in, and not on how that state is reached. If a quantity is not a state function, then its value does depend on how the state is reached. An example of a state function is altitude or elevation. If you stand on the summit of Mt. Kilimanjaro, you are at an altitude of 5895 m, and it does not matter whether you hiked there or parachuted there. 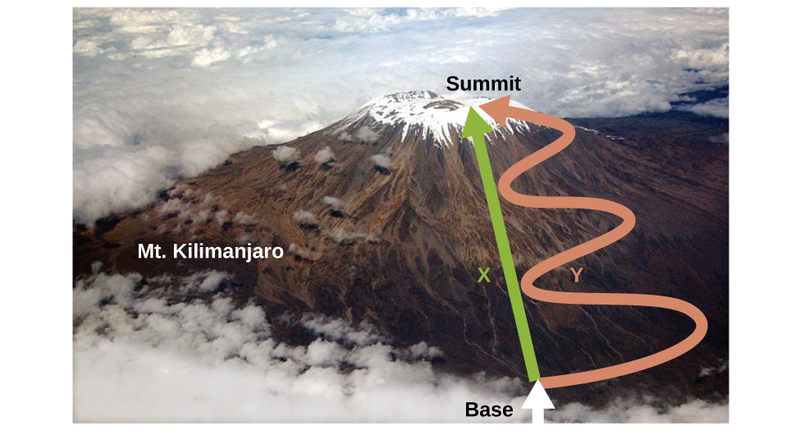 The distance you traveled to the top of Kilimanjaro, however, is not a state function. You could climb to the summit by a direct route or by a more roundabout, circuitous path ([link]). The distances traveled would differ (distance is not a state function) but the elevation reached would be the same (altitude is a state function). where qp is the heat of reaction under conditions of constant pressure. And so, if a chemical or physical process is carried out at constant pressure with the only work done caused by expansion or contraction, then the heat flow (qp) and enthalpy change (ΔH) for the process are equal. The heat given off when you operate a Bunsen burner is equal to the enthalpy change of the methane combustion reaction that takes place, since it occurs at the essentially constant pressure of the atmosphere. On the other hand, the heat produced by a reaction measured in a bomb calorimeter ([link]) is not equal to ΔH because the closed, constant-volume metal container prevents expansion work from occurring. Chemists usually perform experiments under normal atmospheric conditions, at constant external pressure with q = ΔH, which makes enthalpy the most convenient choice for determining heat. The enthalpy change of a reaction depends on the physical state of the reactants and products of the reaction (whether we have gases, liquids, solids, or aqueous solutions), so these must be shown. For example, when 1 mole of hydrogen gas and mole of oxygen gas change to 1 mole of liquid water at the same temperature and pressure, 286 kJ of heat are released. If gaseous water forms, only 242 kJ of heat are released. A negative value of an enthalpy change, ΔH, indicates an exothermic reaction; a positive value of ΔH indicates an endothermic reaction. If the direction of a chemical equation is reversed, the arithmetic sign of its ΔH is changed (a process that is endothermic in one direction is exothermic in the opposite direction). When 0.0500 mol of HCl(aq) reacts with 0.0500 mol of NaOH(aq) to form 0.0500 mol of NaCl(aq), 2.9 kJ of heat are produced. What is ΔH, the enthalpy change, per mole of acid reacting, for the acid-base reaction run under the conditions described in [link]? Be sure to take both stoichiometry and limiting reactants into account when determining the ΔH for a chemical reaction. We have available, and available. Since is needed, C12H22O11 is the excess reactant and KClO3 is the limiting reactant. When 1.42 g of iron reacts with 1.80 g of chlorine, 3.22 g of FeCl2(s) and 8.60 kJ of heat is produced. What is the enthalpy change for the reaction when 1 mole of FeCl2(s) is produced? Standard enthalpy of combustion is the enthalpy change when 1 mole of a substance burns (combines vigorously with oxygen) under standard state conditions; it is sometimes called “heat of combustion.” For example, the enthalpy of combustion of ethanol, −1366.8 kJ/mol, is the amount of heat produced when one mole of ethanol undergoes complete combustion at 25 °C and 1 atmosphere pressure, yielding products also at 25 °C and 1 atm. Enthalpies of combustion for many substances have been measured; a few of these are listed in [link]. Many readily available substances with large enthalpies of combustion are used as fuels, including hydrogen, carbon (as coal or charcoal), and hydrocarbons (compounds containing only hydrogen and carbon), such as methane, propane, and the major components of gasoline. As [link] suggests, the combustion of gasoline is a highly exothermic process. Let us determine the approximate amount of heat produced by burning 1.00 L of gasoline, assuming the enthalpy of combustion of gasoline is the same as that of isooctane, a common component of gasoline. The density of isooctane is 0.692 g/mL. Starting with a known amount (1.00 L of isooctane), we can perform conversions between units until we arrive at the desired amount of heat or energy. The enthalpy of combustion of isooctane provides one of the necessary conversions. [link] gives this value as −5460 kJ per 1 mole of isooctane (C8H18). How much heat is produced by the combustion of 125 g of acetylene? As reserves of fossil fuels diminish and become more costly to extract, the search is ongoing for replacement fuel sources for the future. Among the most promising biofuels are those derived from algae ([link]). The species of algae used are nontoxic, biodegradable, and among the world’s fastest growing organisms. About 50% of algal weight is oil, which can be readily converted into fuel such as biodiesel. Algae can yield 26,000 gallons of biofuel per hectare—much more energy per acre than other crops. Some strains of algae can flourish in brackish water that is not usable for growing other crops. Algae can produce biodiesel, biogasoline, ethanol, butanol, methane, and even jet fuel. of the area used to grow corn) can produce enough algal fuel to replace all the petroleum-based fuel used in the US. The cost of algal fuels is becoming more competitive—for instance, the US Air Force is producing jet fuel from algae at a total cost of under 5 per gallon.1 The process used to produce algal fuel is as follows: grow the algae (which use sunlight as their energy source and CO2 as a raw material); harvest the algae; extract the fuel compounds (or precursor compounds); process as necessary (e.g., perform a transesterification reaction to make biodiesel); purify; and distribute ([link]). Algae convert sunlight and carbon dioxide into oil that is harvested, extracted, purified, and transformed into a variety of renewable fuels. Click here to learn more about the process of creating algae biofuel. A standard enthalpy of formation is an enthalpy change for a reaction in which exactly 1 mole of a pure substance is formed from free elements in their most stable states under standard state conditions. These values are especially useful for computing or predicting enthalpy changes for chemical reactions that are impractical or dangerous to carry out, or for processes for which it is difficult to make measurements. If we have values for the appropriate standard enthalpies of formation, we can determine the enthalpy change for any reaction, which we will practice in the next section on Hess’s law. mole of N2 and 1 mole of O2 is correct in this case because the standard enthalpy of formation always refers to 1 mole of product, NO2(g). You will find a table of standard enthalpies of formation of many common substances in Appendix G. These values indicate that formation reactions range from highly exothermic (such as −2984 kJ/mol for the formation of P4O10) to strongly endothermic (such as +226.7 kJ/mol for the formation of acetylene, C2H2). By definition, the standard enthalpy of formation of an element in its most stable form is equal to zero under standard conditions, which is 1 atm for gases and 1 M for solutions. Hydrogen gas, H2, reacts explosively with gaseous chlorine, Cl2, to form hydrogen chloride, HCl(g). What is the enthalpy change for the reaction of 1 mole of H2(g) with 1 mole of Cl2(g) if both the reactants and products are at standard state conditions? The standard enthalpy of formation of HCl(g) is −92.3 kJ/mol. Note: The standard state of carbon is graphite, and phosphorus exists as P4. There are two ways to determine the amount of heat involved in a chemical change: measure it experimentally, or calculate it from other experimentally determined enthalpy changes. Some reactions are difficult, if not impossible, to investigate and make accurate measurements for experimentally. And even when a reaction is not hard to perform or measure, it is convenient to be able to determine the heat involved in a reaction without having to perform an experiment. The result is shown in [link]. We see that ΔH of the overall reaction is the same whether it occurs in one step or two. This finding (overall ΔH for the reaction = sum of ΔH values for reaction “steps” in the overall reaction) is true in general for chemical and physical processes. 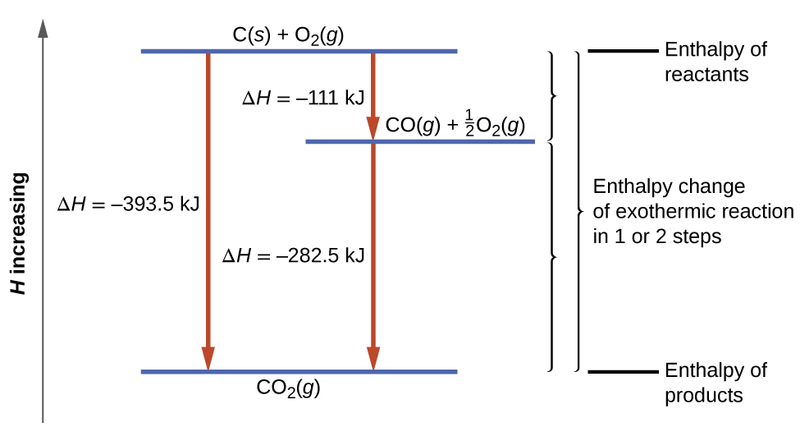 The formation of CO2(g) from its elements can be thought of as occurring in two steps, which sum to the overall reaction, as described by Hess’s law. The horizontal blue lines represent enthalpies. For an exothermic process, the products are at lower enthalpy than are the reactants. Before we further practice using Hess’s law, let us recall two important features of ΔH. In general, if we multiply or divide an equation by a number, then the enthalpy change should also be multiplied or divided by the same number. The enthalpy of formation, of FeCl3(s) is −399.5 kJ/mol. Here is a less straightforward example that illustrates the thought process involved in solving many Hess’s law problems. It shows how we can find many standard enthalpies of formation (and other values of ΔH) if they are difficult to determine experimentally. The following example shows in detail why this equation is valid, and how to use it to calculate the enthalpy change for a reaction of interest. So the standard enthalpy change for this reaction is ΔH° = −138.4 kJ. Note that this result was obtained by (1) multiplying the of each product by its stoichiometric coefficient and summing those values, (2) multiplying the of each reactant by its stoichiometric coefficient and summing those values, and then (3) subtracting the result found in (2) from the result found in (1). This is also the procedure in using the general equation, as shown. Calculate the heat of combustion of 1 mole of ethanol, C2H5OH(l), when H2O(l) and CO2(g) are formed. Use the following enthalpies of formation: C2H5OH(l), −278 kJ/mol; H2O(l), −286 kJ/mol; and CO2(g), −394 kJ/mol. If a chemical change is carried out at constant pressure and the only work done is caused by expansion or contraction, q for the change is called the enthalpy change with the symbol ΔH, or for reactions occurring under standard state conditions. The value of ΔH for a reaction in one direction is equal in magnitude, but opposite in sign, to ΔH for the reaction in the opposite direction, and ΔH is directly proportional to the quantity of reactants and products. Examples of enthalpy changes include enthalpy of combustion, enthalpy of fusion, enthalpy of vaporization, and standard enthalpy of formation. The standard enthalpy of formation, is the enthalpy change accompanying the formation of 1 mole of a substance from the elements in their most stable states at 1 bar (standard state). Many of the processes are carried out at 298.15 K. If the enthalpies of formation are available for the reactants and products of a reaction, the enthalpy change can be calculated using Hess’s law: If a process can be written as the sum of several stepwise processes, the enthalpy change of the total process equals the sum of the enthalpy changes of the various steps. The enthalpy change of the indicated reaction is for exactly 1 mol HCL and 1 mol NaOH; the heat in the example is produced by 0.0500 mol HCl and 0.0500 mol NaOH. Calculate the enthalpy of solution (ΔH for the dissolution) per mole of NH4NO3 under the conditions described in [link]. Calculate the enthalpy of solution (ΔH for the dissolution) per mole of CaCl2. Although the gas used in an oxyacetylene torch ([link]) is essentially pure acetylene, the heat produced by combustion of one mole of acetylene in such a torch is likely not equal to the enthalpy of combustion of acetylene listed in [link]. Considering the conditions for which the tabulated data are reported, suggest an explanation. How much heat is produced by burning 4.00 moles of acetylene under standard state conditions? How much heat is produced by combustion of 125 g of methanol under standard state conditions? How many moles of isooctane must be burned to produce 100 kJ of heat under standard state conditions? What mass of carbon monoxide must be burned to produce 175 kJ of heat under standard state conditions? When 2.50 g of methane burns in oxygen, 125 kJ of heat is produced. What is the enthalpy of combustion per mole of methane under these conditions? How much heat is produced when 100 mL of 0.250 M HCl (density, 1.00 g/mL) and 200 mL of 0.150 M NaOH (density, 1.00 g/mL) are mixed? If both solutions are at the same temperature and the heat capacity of the products is 4.19 J/g °C, how much will the temperature increase? What assumption did you make in your calculation? A sample of 0.562 g of carbon is burned in oxygen in a bomb calorimeter, producing carbon dioxide. Assume both the reactants and products are under standard state conditions, and that the heat released is directly proportional to the enthalpy of combustion of graphite. The temperature of the calorimeter increases from 26.74 °C to 27.93 °C. What is the heat capacity of the calorimeter and its contents? Before the introduction of chlorofluorocarbons, sulfur dioxide (enthalpy of vaporization, 6.00 kcal/mol) was used in household refrigerators. What mass of SO2 must be evaporated to remove as much heat as evaporation of 1.00 kg of CCl2F2 (enthalpy of vaporization is 17.4 kJ/mol)? Homes may be heated by pumping hot water through radiators. What mass of water will provide the same amount of heat when cooled from 95.0 to 35.0 °C, as the heat provided when 100 g of steam is cooled from 110 °C to 100 °C. Which of the enthalpies of combustion in [link] the table are also standard enthalpies of formation? Joseph Priestly prepared oxygen in 1774 by heating red mercury(II) oxide with sunlight focused through a lens. How much heat is required to decompose exactly 1 mole of red HgO(s) to Hg(l) and O2(g) under standard conditions? How many kilojoules of heat will be released when exactly 1 mole of manganese, Mn, is burned to form Mn3O4(s) at standard state conditions? How many kilojoules of heat will be released when exactly 1 mole of iron, Fe, is burned to form Fe2O3(s) at standard state conditions? Determine the total energy change for the production of one mole of aqueous nitric acid by this process. Both graphite and diamond burn. Which produces more heat, the combustion of graphite or the combustion of diamond? The following reactions can be used to prepare samples of metals. Determine the enthalpy change under standard state conditions for each. The decomposition of hydrogen peroxide, H2O2, has been used to provide thrust in the control jets of various space vehicles. Using the data in Appendix G, determine how much heat is produced by the decomposition of exactly 1 mole of H2O2 under standard conditions. Calculate the enthalpy of combustion of propane, C3H8(g), for the formation of H2O(g) and CO2(g). The enthalpy of formation of propane is −104 kJ/mol. Calculate the enthalpy of combustion of butane, C4H10(g) for the formation of H2O(g) and CO2(g). The enthalpy of formation of butane is −126 kJ/mol. Both propane and butane are used as gaseous fuels. Which compound produces more heat per gram when burned? How much heat is evolved in the production of exactly 1 mole of TiO2(s) under standard state conditions? for this reaction and for the condensation of gaseous methanol to liquid methanol. (c) Calculate the heat of combustion of 1 mole of liquid methanol to H2O(g) and CO2(g). Calculate the standard enthalpy of the reaction. The of CaC2 is −15.14 kcal/mol. From the data in [link], determine which of the following fuels produces the greatest amount of heat per gram when burned under standard conditions: CO(g), CH4(g), or C2H2(g). The enthalpy of combustion of hard coal averages −35 kJ/g, that of gasoline, 1.28 105 kJ/gal. How many kilograms of hard coal provide the same amount of heat as is available from 1.0 gallon of gasoline? Assume that the density of gasoline is 0.692 g/mL (the same as the density of isooctane). Ethanol, C2H5OH, is used as a fuel for motor vehicles, particularly in Brazil. (a) Write the balanced equation for the combustion of ethanol to CO2(g) and H2O(g), and, using the data in Appendix G, calculate the enthalpy of combustion of 1 mole of ethanol. (b) The density of ethanol is 0.7893 g/mL. Calculate the enthalpy of combustion of exactly 1 L of ethanol. (c) Assuming that an automobile’s mileage is directly proportional to the heat of combustion of the fuel, calculate how much farther an automobile could be expected to travel on 1 L of gasoline than on 1 L of ethanol. Assume that gasoline has the heat of combustion and the density of n–octane, C8H18 density = 0.7025 g/mL). Among the substances that react with oxygen and that have been considered as potential rocket fuels are diborane [B2H6, produces B2O3(s) and H2O(g)], methane [CH4, produces CO2(g) and H2O(g)], and hydrazine [N2H4, produces N2(g) and H2O(g)]. On the basis of the heat released by 1.00 g of each substance in its reaction with oxygen, which of these compounds offers the best possibility as a rocket fuel? The of B2H6(g), CH4(g), and N2H4(l) may be found in Appendix G.
On the assumption that the best rocket fuel is the one that gives off the most heat, B2H6 is the prime candidate. How much heat is produced when 1.25 g of chromium metal reacts with oxygen gas under standard conditions? Ethylene, C2H2, a byproduct from the fractional distillation of petroleum, is fourth among the 50 chemical compounds produced commercially in the largest quantities. About 80% of synthetic ethanol is manufactured from ethylene by its reaction with water in the presence of a suitable catalyst. Using the data in the table in Appendix G, calculate ΔH° for the reaction. The metabolism of glucose gives the same products, although the glucose reacts with oxygen in a series of steps in the body. (a) How much heat in kilojoules can be produced by the metabolism of 1.0 g of glucose? (b) How many Calories can be produced by the metabolism of 1.0 g of glucose? (a) Write a balanced equation for the complete combustion of propane gas. (c) The heat of combustion of propane is −2,219.2 kJ/mol. Calculate the heat of formation, of propane given that of H2O(l) = −285.8 kJ/mol and of CO2(g) = −393.5 kJ/mol. (d) Assuming that all of the heat released in burning 25.0 grams of propane is transferred to 4.00 kilograms of water, calculate the increase in temperature of the water. (b) How many gallons of LPG (liquefied petroleum gas) would be required to replace the natural gas used? Assume the LPG is liquid propane [C3H8: density, 0.5318 g/mL; enthalpy of combustion, 2219 kJ/mol for the formation of CO2(g) and H2O(l)] and the furnace used to burn the LPG has the same efficiency as the gas furnace. (c) What mass of carbon dioxide is produced by combustion of the methane used to heat the house? (d) What mass of water is produced by combustion of the methane used to heat the house? (f) How many kilowatt–hours (1 kWh = 3.6 106 J) of electricity would be required to provide the heat necessary to heat the house? Note electricity is 100% efficient in producing heat inside a house. (g) Although electricity is 100% efficient in producing heat inside a house, production and distribution of electricity is not 100% efficient. The efficiency of production and distribution of electricity produced in a coal-fired power plant is about 40%. A certain type of coal provides 2.26 kWh per pound upon combustion. What mass of this coal in kilograms will be required to produce the electrical energy necessary to heat the house if the efficiency of generation and distribution is 40%? 1 For more on algal fuel, see http://www.theguardian.com/environment/2010/feb/13/algae-solve-pentagon-fuel-problem. Enthalpy by OpenStaxCollege is licensed under a Creative Commons Attribution 4.0 International License, except where otherwise noted.